I'm a huge skincare junkie, I love the power of what a great mask or cleanser can do to your complexion. Elemental Herbology is a new brand for me, I've seen rave reviews on a few other blogs and thought it was about time I tried it for myself. They're an all natural brand that work on adding goodness back into your skin to harmonise you complexion leaving you with healthy, happy skin. I've been using a few products over the past few months and they've firmly made their way into my 3 step routine. The Vital Cleanse Facial Cleanser is a lovely cleanser that has a consistency quite gel like. As with all Elemental Herbology products its made from a whole host of skin nourishing ingredients such as Manuka honey with Malic acid, Vitamin C, Organic Sea Buckthorn Berry oil, Apple Serum, Green Tea, Grapefruit and Papaya Extract. These all contribute to a really deep cleanse, stimulating cell turnover whilst improving skins radiance and texture. I tend to remove my eye make up separately and then massage 1 to 2 pumps into the rest of my skin to remove anything else. I like to apply this to dry skin and then add a little bit water then massage a little more. I've found this has left my skin looking so clear and balanced recently and I think this is going to be perfect for the colder months. Perfect Balance Facial Moisturiser is a lovely moisturiser for the day as it's light enough to be worn under make up but thick enough to actually keep your skin hydrated throughout the day. It's aimed at oily complexions but I would say my skin is definitely more on the dry side and this works really well for me. It contains SPF12 and has ingredients like apple serum, green tea and acerola fruit to protect the skin throughout the day. Facial Glow Radiance Peel is a chemical exfoliant that works by eating away at any dead skin on the surface of your face. Peel masks are the quickest way to turn around dull looking skin, and I always find they make the biggest difference to my skin. To someone who is new to chemical exfoliants they can seem quite scary and like they would be harsh on the skin but they're really not and this one is very gentle at removing the dead skin. 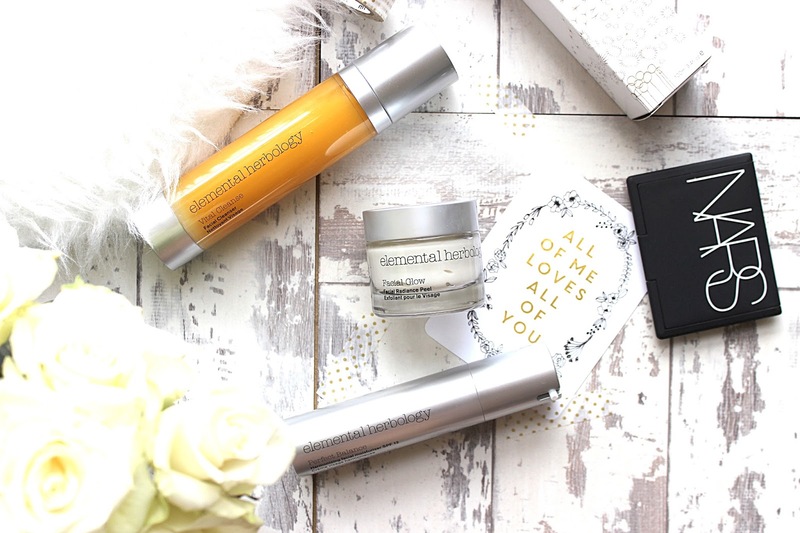 The Elemental Herbology peel is packed with so many skin loving ingredients vitamins and brightening botanical, which improve radiance whilst buffing away the dead skin. I tend to pop this all over my skin, leave for around 4 minutes and then follow with either a really heavy moisturiser or serum to really lock in the moisture. I am obsessed with NARS!